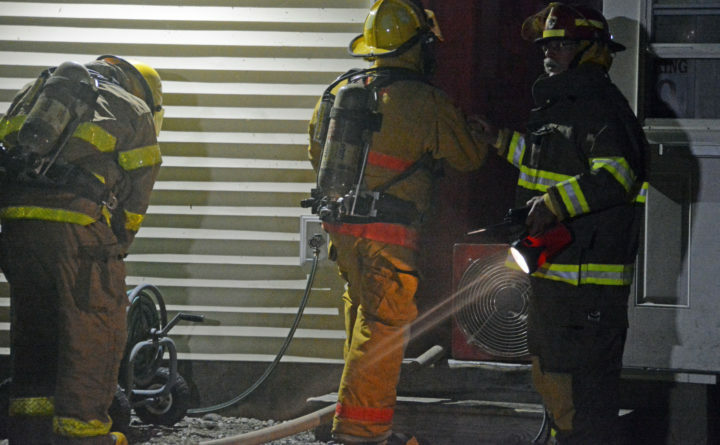 Medway firefighters, seen here fighting a fire at a town restaurant in 2016, will keep going after residents rejected an effort to replace them with East Millinocket firefighters. Medway will keep its fire department despite a proposal to pay East Millinocket for firefighters. The Medway Board of Selectmen voted 3-1-1 on Monday to hire interim Fire Chief Aaron Lee as the town’s fire chief and keep the department intact, said town administrative assistant Kathy Lee, who is Aaron Lee’s mother-in-law. A chronic shortage of firefighters — and a proposal from nearby Katahdin region town of East Millinocket — motivated selectmen to consider eliminating the town’s fire service, Lee said. “At one point, back when the [paper] mills were running, you could have 20-plus people in your departments. Now you have 10,” Lee said Tuesday. East Millinocket’s mill closed in February 2014 after its owner listed more than 1,000 creditors and at least $50 million in debts. Millinocket’s mill shut down in September 2008. Both mills employed more than 500 people. Their loss had a big impact on neighboring Medway. Residents at a special Medway town meeting voted 37-5 on March 27 to reject East Millinocket’s proposal to provide firefighters for Medway coverage at an annual cost of $80,600. The proposal would have entailed having paid firefighters provide eight-hour coverage at the Medway fire station seven days a week. With Medway’s total fire department budget at $65,000, voters likely believed that continuing their department, with Aaron Lee’s commitment, was worth it, Kathy Lee said. The town’s population is 1,336, Lee said.